Hope everyone had a wonderful Christmas. It's always sad to say, but I'm so glad the holidays are almost behind us. I mean, it's crazy how stressed and rushed we become during this time of year, and the fact that we got cheated a week between Thanksgiving and Christmas..it totally screwed me up. I kept thinking I had way more time to do stuff, so of course I didn't get to do everything I wanted to get done. Oh well. There's always next year, right? 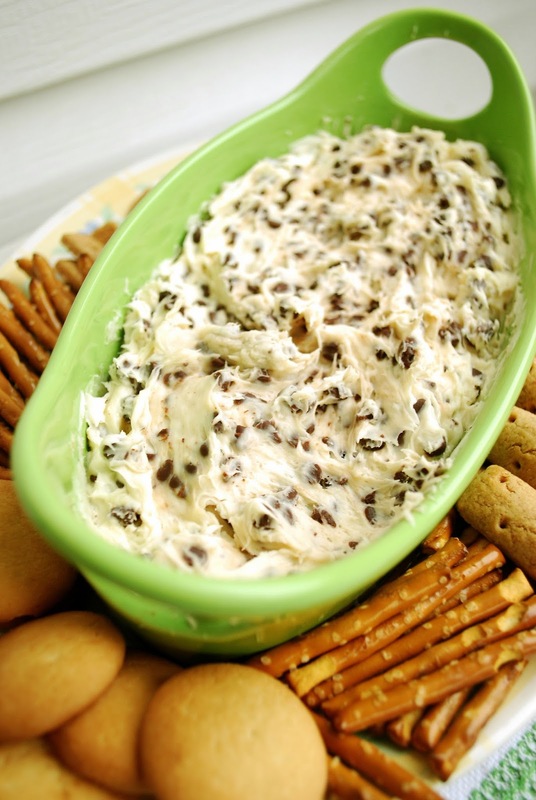 One easy thing I did do this holiday season was make this chocolate chip dip. It's super easy and quick to put together, perfect for those remaining holiday parties. Food for dipping like graham cracker sticks, pretzels, apples, etc. In a small mixing bowl, beat the cream cheese and butter until its light and fluffy. Then, add the both sugars and the vanilla extract and beat until smooth. Serve with your choice of dippers, such as graham cracker sticks, pretzels, etc. Gosh, this looks like something I could plant my face in right about now! Weird question...can you taste the butter? I've seen savory & sweet dips that have lots of butter and get worried that you can detect it. I love me some butter, but it skeeves me out to think about eating it straight up. I'm weird, I know. Yum! I could use of this right now! Oh yum! This sounds fabulous! You can't go wrong with cream cheese and chocolate! A friend of ours had us over for dinner this week and for dessert she served something similar but it was made with ricotta and marscapone cheese.....no dippers necessary!!! I could've eaten it by the spoonful! !